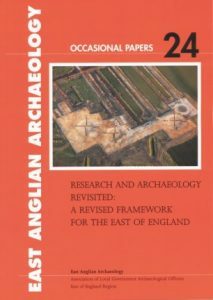 I am currently managing the review of the Research Framework for the Historic Environment of the East of England on behalf of ALGAO East. This project is funded by Historic England and will produce an updated Historic Environment Research Framework that encompasses the needs of the historic environment sector in the East of England. The project will establish an accessible, interactive Framework that can be readily updated and sustained beyond the lifespan of the project. The Framework will make use of an online hub developed collaboratively with Historic England which will bring together disparate resources for anyone engaged in historic environment research in the region. To find out more about Research Frameworks, please visit the Historic England website.